Congratulations to Sharon Blank, winner of Haley’s Holiday Gift Giveaway! As a thank you to all of our awesome readers here, Haley and I have teamed up to bring one lucky person and their pup some wonderful holiday gifts! It’s hard to believe 2015 is coming to an end very soon. It’s been a great year for the blog and I truly appreciate all the visitors who have stopped by this year to read a post, leave a comment or like and share an article. You guys rock! 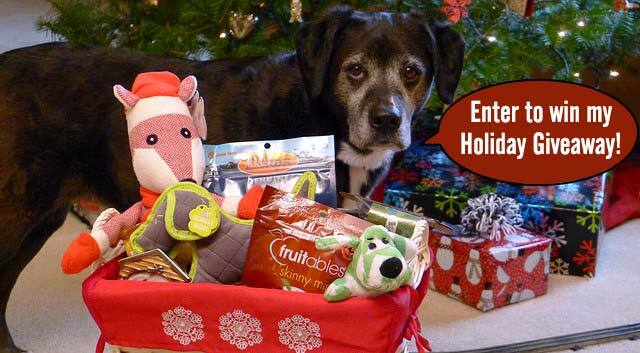 So, whether your pup’s been naughty or nice this year, be sure to enter the giveaway below so they have a chance to win Haley’s gift basket full of goodies and toys (and a few surprises for you as well). Here’s how to enter the holiday gift giveaway! Use the Rafflecopter form below to log in with your email address or Facebook account. Don’t worry, nobody will spam you with additional emails for entering. After you log in, follow the prompts and leave a comment here on the blog to be entered for the giveaway. If you would like extra chances to win, feel free to follow the additional prompts in the Rafflecopter. The winner will be chosen at random and announced here on Wednesday, December 23rd, 2015. The winner will also be contacted via their email address. Please note: Due to the nature of this giveaway, it’s only open to people with a mailing address in the Continental United States. One more thing: If you’re having trouble using the Rafflecopter, just be sure to leave a comment in the comment section and I’ll make sure your name is entered in the drawing. Hard question to answer. My pups said, “define naughty”. BOL!!!! For the most part they have been nice!!!. Awesome! Even when they’re naughty, you can’t help but love them, right? ? Mr. N says he’s definitely a good boy! Way to go, Mr. N! Good luck in the drawing. What a fun giveaway! I’m so glad I discovered your blog this year as I have picked up many interesting and helpful tips reading your posts. Aw, thank you so much for that sweet compliment. I’ve enjoyed discovering your blog and awesome Instagram pics, as well! Look at all those goodies. The Fruitables jump out at me first! Good luck to those entering. We have so many things, we will let others have a chance to win. That’s very nice of you, Emma! Happy Holidays to all of you. ? Thanks, Lindsay! All that gray on her face has made some pretty unique patterns around her eyes, lol! How cool! Thank you for the opportunity! We hope you have a wonderful holiday there across the pond! Good luck to all the U.S folks! Chops has been a very good dog this year. He guards the house and has become my protector. However, he is a sick puppy right now so I hope by entering the give away it will bring him some Christmas cheer. Oh no! What’s going on with Chops? I hope it’s nothing serious. ? I think they’ll like it and there’s a few surprises hidden in the basket for the humans too! That’s a fun basket of goodies! Nice of you to have a giveaway for your readers. (Rita has so many toys – she rarely destroys them so they last ages, so we’ll let others have the chance to win!) Will share! Aw, that’s very nice of you, Jackie. Thanks so much for sharing the post! What a nice thing to do for your readers! My two have been exceptionally good this year, as always. I’ve met so many wonderful and thoughtful people and bloggers, I truly value each and every one of them. I’m glad your pups are on the nice list this year, haha! Fantastic news, Suzanne! Maybe Mary will be the lucky winner! ahhhhh Gambler has been so naughty this year!!! Haha, I saw Gambler’s bucket fishing video! That’s okay, he’s still on Santa’s “nice” list. ? Really? Surely Kilo’s not worried about the “naughty” list, lol! Won’t be entering this year. But wanted to make sure I got a chance to wish you and Haley a lovely Christmas before we head out to places with even less reliable internet. Aw…thanks so much, Pamela! I hope you, Mike and Honey have an amazing first Christmas on the water in your new home. I thought the same thing about the photo of Haley, haha! I think she may be having second thoughts about the giveaway but at least she hasn’t drooled in the basket. ? LOL! ? Thank you for setting the record straight on that, Bentley! Cocoa has been a good girl!! Good girl, Cocoa Bean! Good luck with the giveaway. ? My pups have all been naughty and nice this year, but for the most part nice. I’m glad I had the chance to read your blog this year and looking forward to many great posts from you and Haley next year! Thanks so much, Colby! It’s been great to get to know your pack this year too and I’ve enjoyed many of your posts too. I’m glad I stumbled across your page…found some great tips for my furbaby’s first big road trip to the beach!! What breed is Haley? She looks a lot like my Remington! Hi Karen! I’m glad you decided to stop by too. ? Haley’s a boxer/lab mix and she just turned 9 years old this month. What breed or mix is Remington? I’m so jealous you’ll be making a beach trip soon, Remington will have a blast exploring the sand, surf and those crazy crabs that come out at night! Good luck with the giveaway. The vet thinks it ‘s Pacreatitis. Took him in this morning. They did blood profile and it looked like that was the probably the problem. He is on 24 hr iv drip with high powered antibiotics. He was sleeping and seemed peaceful when I called this afternoon. She will call me in the morning with a progress report. It’s so quiet here. Even Lucy misses him. Oh wow, poor Chops! I hope the antibiotics work quickly and he can recover at home with you guys. Sending you good thoughts and prayers this morning. ? Cole has his moments of both, when he’s good he’s very very good, and when he’s naughty…. oy! Thanks for entering the giveaway, LeeAnna! I’m sure Cole deserves lots of goodies this year, naughty or nice. ? It has been great finding out about and visiting your blog this year, Elaine! 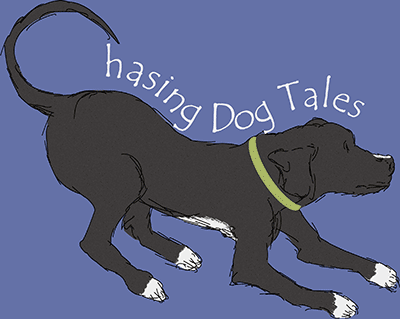 I’m looking forward to many more fun & informative posts on chasingdogtales in 2016! Thank you, Barbara! I absolutely love your blog because I always learn something interesting and helpful in your posts. As for Buzz and Missy, I find it really hard to believe either of them could be even a little bit naughty! ? My two pugs are on the “nice” list this year. My oldest one has had a couple of naughty moments, but I will overlook those because he is elderly and has hip problems:( I love them both very much! Aw, just like with our human seniors, we have to cut our senior pups some slack sometimes. I bet they’re both adorable. Good luck in the giveaway and happy holidays! ? Don’t worry, Zelda. Haley knows exactly what you mean by just wanting to play with the cats. I’m so happy for your new home and I hope you have the best holiday ever! ? That’s a cute picture and super nice of you guys! Bella has been nice (of course ;)), Terra has been mostly nice with bits of naughty thrown in, and Kronos has been more naughty than nice! (Though he’s getting there) <3 Happy Holidays! Happy Holidays to all of you too and good luck to Bella, Terra and Kronos. There are plenty of toys and treats for all the pups! Lucas (3) – is a gentleman he is always nice even when Lola (will be 1 on 12/25) is being naughty and nibbling on his legs and grabbing this things away from him even when they are in his mouth. So I have one of each. I think Lucas and Lola will love exploring all the goodies in the basket. Maybe give Lucas a head start though, if you win, lol! I would say someone was naughty and someone was nice, LOL but they both still get gifts! What a very nice thing to do. I would have no problem guessing who’s on the naughty list and who’s on the nice list but you’re right, they both deserve lots of fun gifts this year! How exciting! That basket looks adorable, filled with all kinds of goodies. Thanks for the opportunity! Haley and I had a lot of fun shopping for all the goodies. Good luck, Lindsay! ? We love all the holiday giveaways – We’re IN! I’m sure Jack and Maggie would love some cool toys and holiday treats! Awesome! Thanks for stopping by and entering the giveaway, Heather! Wow, four pups and they’re mostly nice…that’s awesome! ? Puppy can be a smarty pants and thinks he is funny, but rarely naughty. I know exactly what you mean, Denise! It sure would be a boring world if they were perfect, right? Haley and I had so much fun finding all the things to pack inside. Good luck, Cathy! Nice give-away. I think the jury (or Santa) is still undecided on whether brown dawgs have been naughty or nice…lol. Aw, they might just have to wait until Christmas morning to see what’s in their stockings, lol! Our pup is always nice. MY cat is the naughty one but she still gets treats. I have a feeling the cat rules the house, right? Lol! Ah yes, Haley knows all about the joy of getting into the trash can, lol!